Guillbert T. Patac, a graduate of the University of Bohol College of Engineering and Technology placed 9th in the 2014 Registered Master Electrician Board Examination given this month of September. With Patac, are two other registered master electricians Reic Mariel M. Paradero and Arnelo A. Paracullos. In an official communication, Engr. Liberato H. Lupot, Jr., college dean likewise released the results that include the names of new electrical engineers who passed the September 2014 Board Examination for Electrical Engineers. The successful examineesare Engr. Mario P. Calimbo, Jr., Engr. Jose I. Dalogdog, Jr., Engr. Mark Joseph V. Ranario, Engr. Luis F. Saldajeno, III and Engr. Jieco A. Zabala. The same list also disclosed the name of Engr. Leonie E. Busano who hurdled the Board Examination for Geodetic Engineers given last August 2014. UB Criminology student delegates with Dean Jesus C. Acullador during the 1st National Criminology Students Congress on August 30-31, 2014, Cebu City. Inset – Ladie Lyn G. Fuderanan, Outstanding Criminology Student of the Philippines. Ladie Lyn G. Fuderanan, a third year Criminology student of the University of Bohol was chosen as one of the Outstanding Criminology Students of the Philippines by the Professional Criminologist Association of the Philippines (PCAP) during the 1st National Criminology Student Congress held on August 30-31, 2014 at Cebu Coliseum, Cebu City. Dr. Janice Aurora B. Tirol (center), UB SPS Dean receives the plaque of recognition as Outstanding Student Services Head at Balanghai Hotel and Convention Center, Butuan City. 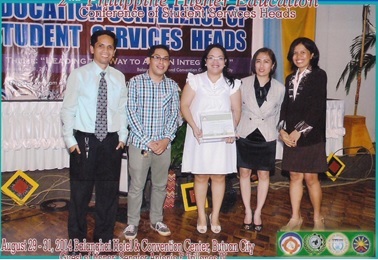 The awarding ceremony coincided with the 2nd Philippine Higher Education Conference of Student Services Heads held last August 29-31, 2014, on the same venue. Engr. 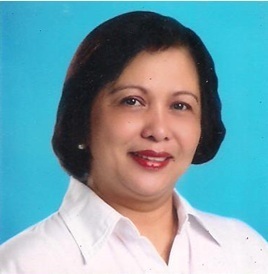 Eudoxita Cinco-Lomaad,UB Mathematics coordinator, will assume post as new head of the University of Bohol-Victoriano D. Tirol Advanced Learning Center effective August 26, 2014. This according to Dr. Victoriano B. Tirol III, acting vice president for administration. In a letter sent to all deans, principals, office heads and students, Dr. Tirol, formally announced the designation of Engr.Eudoxita C. Lomaad as OIC Principal of VDT-ALC vice Ms. Ellaine Joy Auza.